Come join us for breakfast, while we hear from our guest Nkurunziza Francis (Co-founder & Director of Hope for Life Katanga) as well as the rest of the Hope for Life team from the UK. Francis will share a little about his background growing up in Uganda, before talking about the exciting work we are currently doing in Katanga (& beyond?). Francis, Megan and Mark will be sharing stories, pictures and videos throughout the morning. There will be a time for Q&A at the end too, all while you enjoy a cup of coffee, croissant and perhaps a Ugandan chapati. There will be a crafts area in the hall, as well as lots of outside green space if the children (or adults) want to run about. Please register that you are coming to the breakfast by ‘purchasing’ free tickets from our event page. My name is Arua and I am 10 years old. I live in Katanga but before I used to live in the village. I live with my father & mother. My parents separated but my father sells second hand clothes and shoes and my mother works in a saloon as a hair dresser within Katanga. I have three siblings, two sisters and one brother who is eleven years old. My sisters are six and four years old. My mother pays for my sisters school fees as she can only afford for one child. I was in primary two at a primary school in the village but due to lack of school fees I dropped out. It was my father paying my fees, before I left and joined my mother in Katanga. I was registered with Hope for Life Katanga after my mother talking to Hope for life management. I love this organization because it supports me am now in a creative learning center and it taught us how to read and write and my teachers are a blessing because they like us so much. I am so happy because I managed to meet other children with the same problems like mine; they are friendly and very willing to study. This has given me the hope of studying in order to become a pilot in future which is my dream. Yellow, pink and red are my favorite colors and I love them so much because they looks nice, my best dish is rice and chicken, chips, irish potatoes plus Macrons, I like playing games netball and nobbling. Arua and the other girls in the CLC are now looking for sponsors to take them to a school in the city, for £20/month, to further their education. If you are interested in sponsoring a child with us then send us an email at hopeforlifekatanga@gmail.com. * We have changed names and edited the written story for child protection reasons, otherwise the story was either written by Arua or transcribed by one of our social workers. Here are some pictures from the Creative Learning Centre. You can find out more information as to exactly what the Creative Learning Centre is here but I will let the pictures do the talking in this post. Starting today (10th June) these six girls, plus six more will be starting at the Creative Learning Centre (CLC) for the next step in their education. We are partnering with Viva (an international charity focused on creating a network of organisations to create lasting change) and Kampala Baptist Church, to help run this education program, adopting the students into the wider vision we have at Hope for Life Katanga. Originally the CLC accommodated each class for 3 months, educating them in all things creative. Adopting this project and its students into our wider education program, practically means overseeing the selection of the children from Katanga into the CLC, as well as providing follow up support in each child’s education, following the 3 months in the CLC. We will also be supporting the current teaching staff in the fantastic work they are already doing. A few of the girls have children which they bring with them to the CLC. As soon as schools in Uganda realise a girl is pregnant they will exclude her, offering no other option of continuing her education. After their 3 months in the CLC we will be looking for sponsors to take these children to a school in the city for £20/month. For those who are too old, have children or it is otherwise not suitable to go back to a mainstream school, we will still be looking for sponsors to take them to a vocational school, to further the practical skills they learnt in the CLC, bettering their opportunities to finding a job and earning a sustainable income for them and their families. If you are interested in sponsoring a child into either a school for the next 5 years, or sponsor a child into vocational school for the next 2 years then let us know by filling out the form below. We would love to hear from you. If you have been taking part in #MatchitMay then head on over to our fundraising page to make your donation. #MatchitMay – Why don’t you join us? Child Sponsorship… good or bad? I have have just finished listening to a 30 minute radio program on child sponsorship, it looked at the positives of child sponsorship and also the negatives. It is definitely worth a listen too yourself and you can do so clicking here (this may only be available for people in the UK, so sorry if you are trying to listen from around the world). There were a number of queries raised about how different charities ran the child sponsorship program and I though I would write a little post to explain how we run our sponsorship program at Hope for Life. You don’t have to listen to the radio show to follow the post below though. Is the admin cost of running a sponsorship program really expensive? Does it really help change the individuals future? Surely sustainability is helping to change a community not just an individual? What happens when the sponsorship comes to an end? This questions is definitely aimed at huge charities as opposed to localised charities like us. Big charities need to consider staffing costs to maintain the program, including the links back and forth to the western sponsor. There are also transport and other admin costs involved. We don’t hire any additional individuals to maintain the sponsorship program (not that this is a problem, if child sponsorship is such a benefit to the individual/community then it is worth hiring more people), although it is part of our Education Officers job description to oversee that all the children’s school fees are paid each term and they are progressing well in school. Our costs to maintaining a sponsorship program is extremely minimal. Does it really help to change the individuals future? One of the co-founders of Hope for Life, grew up being sponsored by one of the charities mentioned in the radio show. He testifies to how that sponsorship program changed his and his families life, explaining how he got an education as a result and how he now has the life to be able to support him, his wife and his family back in the village. There were things that he noticed, whilst growing up in the sponsorship program, that he would change/alter how specifics were carried out. It is invaluable to have his insight on the team and we have implemented/are implementing these thoughts into ours. I have heard a number of testimonies from people who grew up as a sponsored child, of how their life has been transformed as a result, escaping severe poverty and now in a position to get a well paid job. We are into the 2nd year of our sponsorship program and are already seeing the change in individuals that have been sponsored. This has of course been backed up by the few years they have been attending our catch-up program, instilling the basics of education. If you compare these children to how they were before they attended our catch-up classes, or even to other children the same age, which currently don’t go to school, it is unbelievable how much they have progressed. Throughout the year our staff send us report cards of the children sponsored into school are getting on. It is always a joy to read them, thinking back to Sept 2011 when we first started teaching them in our catch-up classes. This has been a big criticism of charities who are only focused on child sponsorship but as it was reported on the radio program, “One way of changing the community is to empower and change individuals, which then in turn changes the community” (I paraphrased slightly as I didn’t write the quote down). We however differ in that alongside our education program we run our Livelihoods program. This link is huge, something that we focus most of our time and energy on, working with the parents of the children in our education program in helping them to earn a sustainable income for them and their families. This means that we hope each child will be sponsored for approximately 5 years, by which time, we have given a loan, training and/or other support, to the parents to earn a sufficient income to then go on and pay for their own child’s education. Because this is how you change a community isn’t it? By empowering families to look after themselves, free from poverty. So if you sponsor a child with us, on year 4 of your sponsorship, we may ask you to reduce the amount you give, this is because we have hopefully empowered the parent of the child in such away that they are now in a position to be able to start paying a small amount towards the school fees. In this way the parents slowly adapt to paying for their child’s education as their income increases. We feel this gets the best of supporting an individual as well as, supporting the family, all the while boosting the micro-economy within Katanga, helping to change the community. Other ways we support the community is providing education, healthcare, support in their businesses and jobs, guidance and counselling. We are also continuing to look for a sustainable way to provide clean water and better sanitation. There is a feeling that sponsorship creates a sort of financial dependency. As you have read a few paragraphs ago, we hope help the parents slowly adapt to paying school fees for themselves. After that the child should be in a family that is now able to support their needs sufficiently. 5 years later, both the child and the family will be in a better position to be able to maintain a lifestyle free from poverty. So I hope that gives you an insight into how we run our sponsorship program. It was quite a long but hopefully worth reading. Perhaps it’s a dangerous thing for a charity to talk about the negatives of child sponsorship but I would be interested to hear your views, ideas and concerns about such a program. You can leave a comment using the comments section below this post. If you are interested in sponsoring a child with us for £20/month then send us an email at hopeforlifekatanga@gmail.com. Just to finish, I love that line from the little girl from Ghana (on the radio show), “I am surprised that someone so far away loves me so much”. Just to let you know this is not a ‘happy update’ but unfortunately, it is part of reality and something our team wanted to share with our supporters to give you an insight into health problems within Katanga. As you may well have heard, during last week, one of the students in our catch-up classes died of cerebral malaria. ‘Trina’ died after contracting the infectious disease and within 24 hours, from recognition that she was ill, she had passed away. She joined our catch up classes when I was over in Uganda, in October 2013. Being a young 4 year old, I remember she was easily distracted, often bossing boys of her age around. 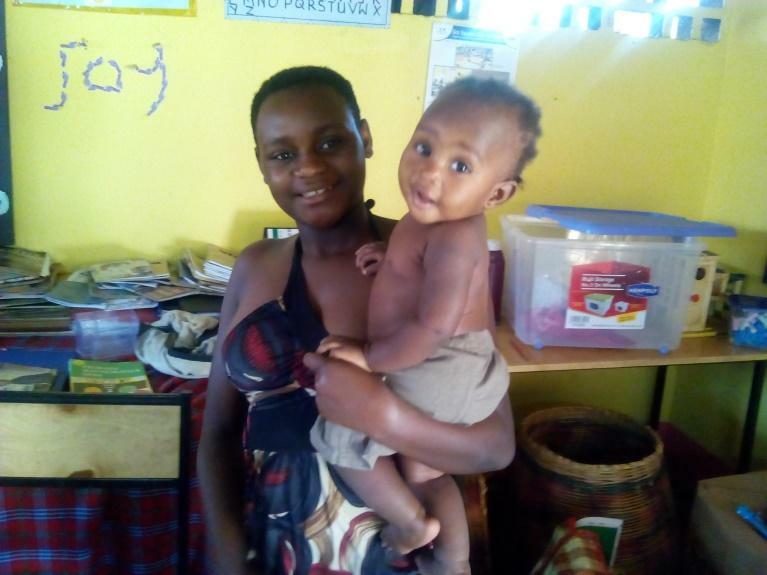 Even though she had this tough side to her, she would love colouring and singing with the rest of the class, progressing well in her learning over the past 6 months. People dying in Katanga is not uncommon but it hits further when it is a child you know and have invested your time in. There are a number of things that we do at Hope for Life we hope will reduce unnecessary deaths; giving out mosquito nets, delivering trainings and workshops in the area of health and providing free health check-ups and advice, by a trained nurse that we employee once a week. One of the most important parts of our job is counselling, mourning with the family, helping them when tragic events do happen. Our staff went with the family, to the burial in her families village. Thanks for your support through the many good times and equally through the tough to comprehend. Since early 2013 it was quickly becoming clear that we needed to purchase another building for our Livelihoods work. We had been using our Education building for parent workshops and classes but we were struggling to fit these classes alongside the children’s catch up classes. So during last year we bought another building in Katanga that we have now started to renovate for our Livelihoods project. We want to be able to empower adults in the community in earning a self sustaining income. We currently do this by teaching money management, business management and practical workshops that will help them to find new skills or further existing skills, which will assist individuals in running successful businesses. We want to have a purpose built building that will be able to strengthen our Livelihoods work and be able to transform the lives of many lives in Katanga. The pictures below shows some of the Livelihoods work in action, whether it is in the blue catch up classes, on the pathways of Katanga or in individuals homes. We are so excited for the potential that this building offers. The women, who we have given loans to, are now using the building to repay their loans and are also just as excited as we are to set up the sewing machines in the new building. Our Livelihoods officer has busy planning and organising all the activities/workshops/trainings etc. that we will offer to Katanga residents when the building is complete, workshops including tailoring, catering, craft making, hairdressing. We are now eagerly waiting tables, chairs, blackboards and cupboards so we can start using the building properly. Thanks to all those who have helped donate towards the work we are doing in Katanga. Last week Hope for Life Co-Founder, Megan, said that it had felt like this new year has ‘crept’ up on us. I completely agree with that statement, for some reason 2014 seems to have come really quickly for us, after a successful and packed 2013. A lot has happened within this past year; from having our first child sponsored to go to school in January 2013, to having 10 children sponsored starting back at school this month. As we have had 10 children sponsored, we have welcomed 10 more children into our catch up classes. We have some new staff, who are really going to help progress the work we are doing further and have said goodbye to some of our faithful, staff and volunteers who have now moved on. We are so thankful for their early commitment to the work we do in Katanga and are sad to see them move on but we are so excited for our current team and for the work we are going to do during this next year. We have acquired a new building for our Livelihoods work, which is being renovated during this Christmas/New Year break. We can’t wait to give out more loans to women in Katanga to start their businesses and earn a ‘living wage’ to pay for their children’s education. We are looking forward to helping as many families as we can on their journey to escape poverty. We are looking for more people to give monthly to the work we are doing in Katanga. If you feel you are able to give something monthly e.g. £5 – £20 – £100 then please let us know by emailing us at hopeforlifekatanga@gmail.com. If you are not sure but would like to give a one off donation then you can go to to our online payment website to give a donation. Big thanks for your support throughout 2013 and we are looking forward to the year ahead.